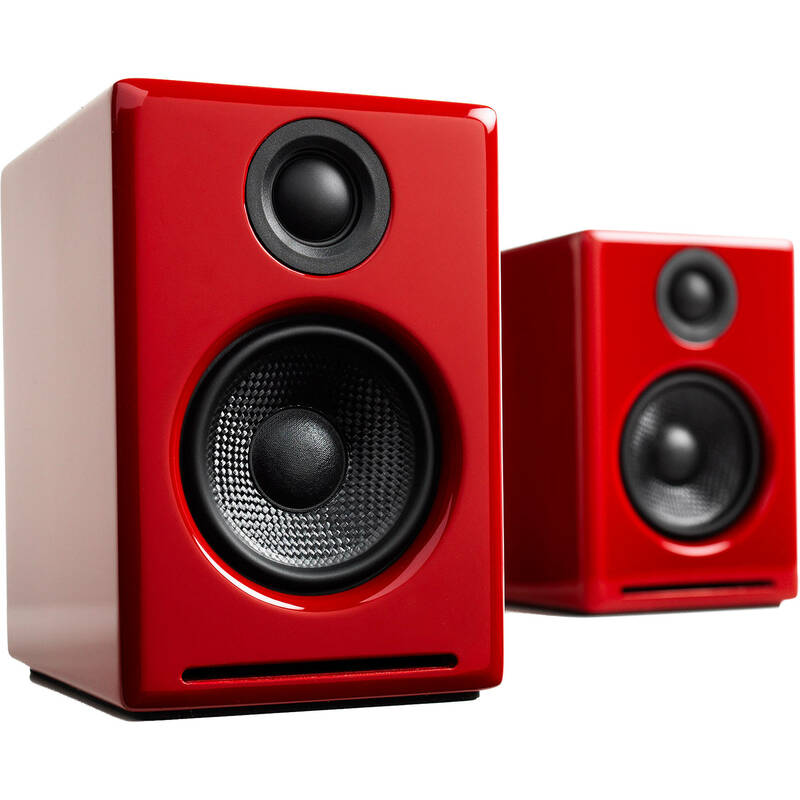 Designed to connect to virtually any device, the hi-gloss red Audioengine A2+ Wireless Bluetooth Speaker System provide an analog RCA stereo input, 1/8" input, and Bluetooth connectivity with aptX for wireless connectivity with your compatible devices. The speakers consist of a 2.75" woofer and a 0.75" tweeter and output up to 15W per channel RMS, or 30W per channel peak. For your convenience, all connectivity is via the powered left speaker, which connects to the passive right speaker with the included speaker wire. The speakers are magnetically shielded, allowing for placement near your TV or other sensitive devices. The A2+ Wireless speakers can connect to nearly any Bluetooth source, so you can wirelessly play your favorite apps like TIDAL, Spotify, Pandora, and more. The Bluetooth receiver built into the A2+ Wireless features aptX coding for enhanced quality with compatible devices. aptX is also backward-compatible with the SBC and AAC codecs, so you can enjoy audio from nearly any Bluetooth-enabled device. Further, the A2+ Wireless has a Bluetooth range of up to 100' with virtually no degradation in audio quality. These speakers feature acoustic and electrical designs to help provide enhanced bass without using digital signal processing or bass boost circuits. There's no network to set up or passwords to create; simply plug in or pair your source device and enjoy. The cabinets, drivers, bass port designs, amplifiers, and crossovers are all tuned together to help create an efficient system that requires less power than passive speakers and a separate integrated amplifier or similar A/V components. With all the electronics built into the left speaker, it's easy to connect your source device of choice. All the circuit boards for the power and preamp sections are vertically mounted for augmented mechanical shock protection. The A2+ Wireless speakers use ferrofluid-cooled, silk-dome tweeters with neodymium magnets. The tweeters are engineered to hold up well under high power, and the edge-driven design helps provide smooth response. The aramid-fiber woven-glass composite helps the woofers retain their shape when being driven at high levels. Both of the A2+ Wireless speakers are magnetically shielded, so you can place them near your display or other sensitive devices. Box Dimensions (LxWxH) 15.2 x 11.0 x 7.2"